After I included my drawing of the little ballerina in my post In the Temple of my Daily Life, Susan suggested to me I look through my drawings and see if there was one that I’d like to use as part of a new look for the header of my blog. I knew right away which one I would pick. 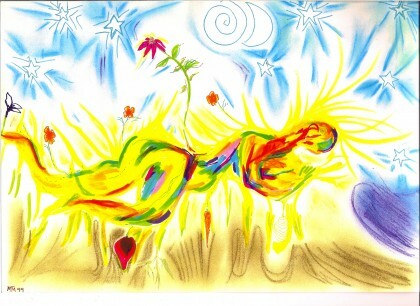 I made the mixed media drawing called “Listening to the Earth” in a large spiral bound sketchbook way back in 1999. It depicts a state of attentiveness to the world that lights it up and encourages healing for me. I can always feel this by being still and laying down on the earth. And this drawing reminds me that I have that power. We all do. I have drawn and painted off and on all my life. I began to draw and paint again in short spurts whenever I was able to because right after my diagnosis of MS in 1996 I made a list of things I had done enough of, and things I hadn’t done enough of. Making art was in that second column. Each June Moscow celebrates Art Walk, which always starts on a Friday. Many businesses show art and keep their doors open all evening. The whole downtown is one big art opening, with people strolling and enjoying local art, music and refreshments. Children make chalk art on the pavement of Friendship Square. Our community radio station KRFP also opened its doors this past June with “The People’s Art Show”—which was all artwork done by station members. When the station put out the call for art, I knew my time had come. Thanks to this wonderful way of eating. I was now well enough to hoof it a couple of miles out to the mall (with Romeo assisting), buy some lightweight inexpensive frames, carry them back home, and frame a few pieces for the show. “Listening to the Earth” was one of those pieces. Eating low fat plant-based whole foods has given me back the stamina to pursue my creative life in ways I did not expect. It also literally helps me “Listen to the Earth” in settings I never expected to experience first hand, like the beautiful Clackamas River where Mike and Kelly “took the plunge” last month. And now it’s got me obsessed with making visual art again. I will always be grateful to the woman at the Co-op who first made me look at my drawings again as if someone else besides me might enjoy them, and that she kept the door open until I was ready and able to accept her invitation to show them. This coming February, I will be having my very own art show at the Moscow Food Co-op. “Listening to the Earth” may be on the wall again, but there will be new work as well. I feel many friends in the present and teachers from the past supporting me as I spread my art wings once again. The mostly wordless realm of spatial relationships, interconnected lines, color, light and shadow has called me back into it this summer. That call is irresistible to me. Although it’s very hard to find words for what that’s like, I’ll try to show more about my timeless time “there” as I am able to. But for now, I hope you enjoy the colors and spirit of “Listening to The Earth.” In my view, it really is the state of being that makes miracles possible. I would purchase a print of of this! You should put up more images of your work and see what sort of response you get. IT’s really lovely work. Thank you so much, Cara, for this beautiful feedback about my drawing, and for your interest in my work. I hope, perhaps, by my show in February, to be set up so I can offer people prints and cards of my work online. I will definitely let you and my readers know about this as it comes to fruition. Like you, I find that connection to body, soul and earth is so much more easily accessible eating vegan. Hooray for that, too!! Beautiful! You are truly a talented artist, in both words and pictures. “Listening to the Earth” communicates so much – I love the colors and lines – to me, I see peace and strength and love. I, like others, would love to frame it and keep it on the wall! I definitely think it’s a brilliant idea to sell prints. I wish you all the best at the show! That’s so exciting. I wish I could stop by to meet you and see all your artwork – but I will be there in spirit. Thanks you, Veronica, for this beautiful comment and for the encouragement about showing and offering my work for sale, too. I will keep everyone posted as I make progress in that direction. I love to think of “Listening to the Earth” on your wall, offering you encouragement. I know you will be there with me in spirit, and who knows, maybe some day we will meet in person! Sounds so much like my story Maria, I am also an artist who thought much like yourself, although had much encouragement from friends throughout the years. And I am hopeful, like yourself, to regain myself through a vegan and nutrarian diet. Would like to see more of your work. Thank you, Kathleen, and it’s lovely to hear that you are an artist, too. I, too, hope for you to regain yourself through a healthy vegan diet. I hope you are still doing your art when you can. And I hope to show more of my work here, and elsewhere, as time goes on. So wonderful to have such great support from my readers!! This time, the depth of connection specifically comes from ” I made a list of things I had done enough of, and things I hadn’t done enough of. ” Wow…my mind started the list immediately and I will write it next week when I’m on holidays, a perfect task to start the recharge. Also grateful for the reminder for me to practice grounding…I guess you’re aware of the science of Earthing. I love your new blog banner! Your art is beautiful. 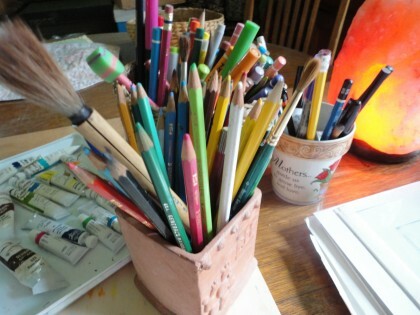 And the pic of your art supplies makes me want to find some supplies of my own, or better yet, sit right down at your desk! Thank you for all your great recipes and ideas. It really helps me knowing someone out there is eating the way I do!